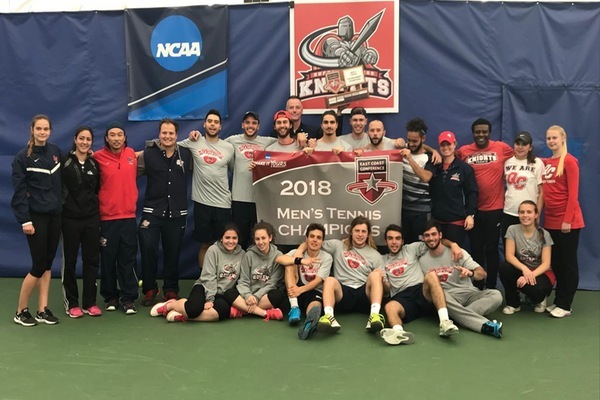 The Queens College men’s tennis team captured the East Coast Conference (ECC) championship for the second straight year by defeated the New York Institute of Technology this past weekend. The Knights got off to a fast start by winning the three doubles flights, led by Gabriel Mendez and Lucas Martinez win at first doubles. Soon after, Roman Laga defeated Maxton Cook 6-2, 6-0 at third singles to inch the Knights closer to the win. Richard Sec clinched the win for Queens with a 6-2, 6-1 win over Rares Ispas at fourth singles. Queens now awaits where it will be seeded in the NCAA Tournament. The selection show is now slated for Tuesday night.